The rancor ravaging All Progressive Congress APC in Rivers state has gradually paved way for Distinguished Senator Magnus Ngei Abe who is the authentic governorship candidate of the party as candidature has no pending legal impediments currently existing in any court of law in Nigeria. www.towncrier.ng in its findings gathered that with the striking out of the Ojukaye Flag Amachree’s appeal at Port Harcourt Judicial Division of APPEAL COURT on Wednesday 31st of October 2018 has removed any legal impediments about the authenticity of Comrade Peter Odike led All Progressives Congress APC in Rivers state. “Let me start by stating, for the avoidance of doubt, that as at today the 31/10/2018, no division of Court of Appeal anywhere in this country is hearing any appeal from the well-reasoned judgment of the Port Harcourt High Court delivered on the 10th of October, 2018, correctly nullifying the illegal Ojukaye Executive of Rivers APC and voiding all indirect primaries (Governorship, Senate, House of Representatives and House of Assembly) conducted in Rivers State by the APC. Whoever tells you that judgment was before the court of appeal today is telling you lies and deceiving you. Don’t let him. The only appeal that was before the court today was that filed sometime in June this year against the Order of Interlocutory Injunction issued by a Port Harcourt High Court on the 11th of May, 2018, restraining the APC from conducting further congresses in Rivers State pending determination of substantive suit that was before the High Court. It’s already public knowledge that the party was in grave, willful disobedience of that order for which it is grappling with grave consequences today. In view of the potent legal reality in respect of the momentous Supreme Court judgment of the 22/10/2018 which gave eternal legal vitality to that order of Interlocutory Injunction and the Mandatory Injunction that followed, it was only normal that the appellants would try to adjust their case. So they prayed the court to strike out many motions and applications made which had already been overtaken by the judgment of the Supreme Court. The respondents today withdrew certain motions and made necessary adjustments. ALL PENDING APPEALS BORDERING ON THAT ORDER WERE TRASHED BY THE COURT OF APPEAL. That left the court with the appeal bordering on the jurisdiction of the lower court to hear and issue the interlocutory Order which it issued on the 11th of May. Counsel to the appellant wanted the court to go straight and hear arguments in that Appeal but counsel to the respondent countered by saying that there is a Supreme Court judgment which says that the court of appeal must hear and discharge through rulings all preliminary motions and applications before hearing the substantive appeal. The respondent counsel also prayed the court to strike out the appeal on the ground that it has become spent the trial court having delivered judgment in the substantive matter. Court of Appeal asked lawyers to exchange file briefs of argument and adjourned to 14/11/2018 for ruling on the application as at today, the law on Rivers APC is the judgment of the Supreme Court delivered on the 22/10/2018 and the judgment of the State High Court delivered on the 10th of October, 2018. The illegal Ojukaye executive in Rivers APC remains nullified and non-existent. All the Indirect Primaries conducted in Rivers APC (Governorship, Senate, House of Representatives and House of Assembly) remain voided and non-existent). No single person who emerged through any of the indirect primaries is a candidate of the party in any elective position. The only party structure in Rivers State that is not legally encumbered is that led by Prince Peter Odike JP. That is the APC in Rivers State today. Finally, the candidates the party have in all elective positions are all those who emerged through the DIRECT PRIMARIES conducted in Rivers State. Those are the candidates free from all legal sanctions as at this moment and those are the only candidates the party can field”. 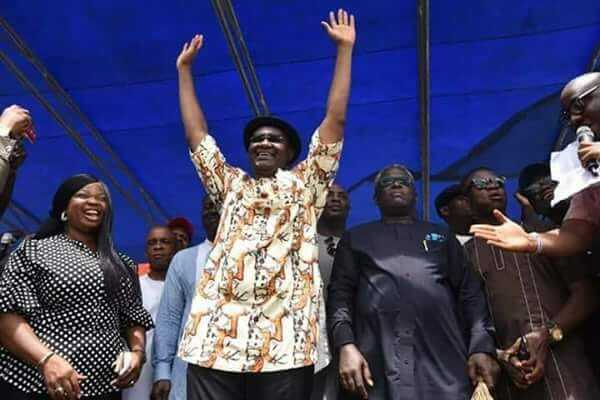 Currently the entire political atmosphere in Rivers state APC remains tensed with optimism and raised hope for those members and supporters of Senator Magnus Abe keeping vigil for the final substitutions in accordance to Supreme Court’s Judgment.